The Braintree payment gateway will allow your attendees/registrants to pay for their event registration with a credit card, debit card, or even through PayPal. Need to Buy a Support License for the Braintree Payment Gateway for Event Espresso 4? Download the latest version of the Braintree payment gateway for Event Espresso 4 from your Event Espresso account. 1) Log in to your production account on Braintreegateway.com. 2) Click on Account in the top right area of the screen. 4) Scroll down and click on View API Keys under the Authorization section. 5) Existing API keys will be visible,c and you can click on one to view more information. If you do not see any, then click on Generate New and a new set of API Keys will be created, and the page will refresh. Click on the new API key and then copy the Public Key, Private Key, and Merchant ID into your payment settings screen for Event Espresso and then save changes. Want to test Braintree before accepting payments in live / production mode? Follow the steps above and select Sandbox in step 1. That will take you to the sandbox site where you’ll be able to retrieve your credentials. Be sure that debug mode is turned on in the payment method settings screen for Braintree for Event Espresso. Once you are finished testing, it is important to turn debug mode off and re-enter your production / live credentials and save changes. Will Braintree be the only payment method enabled or the only one you offer? Click here to learn how to make it selected by default during the registration checkout. A Braintree account is needed to accept payments via Braintree. Need an account? Sign-up for a Braintree merchant account to get started. Login to your WP-admin (WP Dashboard) and go to Event Espresso –> General Settings –> Payment Methods. Once on the Payment Methods screen, click on Braintree and click on the button to activate the payment method. Merchant ID – A unique identifier for your gateway account, which is different than your merchant account ID. Public key – User-specific public identifier. Private Key – User-specific secure identifier that should not be shared. Located in Europe or outside of the United States? By default, the payment gateway will ask for a full address including a state/province and a zip/postal code. Your Braintree merchant account can accept payments via PayPal and offers CVV which can reduce fraud. The CVV setting can be found by logging into your Braintree production account and then clicking on Settings and then Processing. Now scroll down and look for the Basic Credit Card Fraud Tools section and click on Edit under CVV. Place a checkmark next to the first two options and then save changes. The Braintree payment gateway will let you accept payments via major credit or debit cards. A Braintree account is needed to accept payments via Braintree and an SSL certificate is recommended for securing your website. I’m using an old version of PHP. Can I still use the Braintree payment gateway? Braintree requires PHP 5.4 or newer and cannot be used with older versions of PHP. This is a requirement from Braintree. Click here to view a sample message that you can share with your web host if you are using an older version of PHP. I configured Braintree and payments are not being processed. Can you help? Double-check your credentials to make sure that you are using the production / live credentials which are for production mode. Also, ensure that there is no extra spacing before or after the credentials in the payment methods page of Event Espresso. 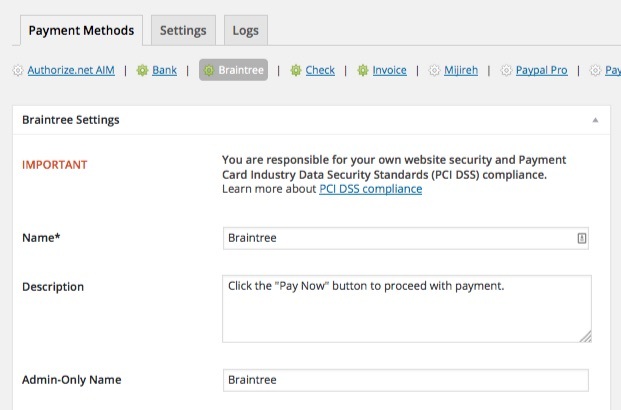 How can I set up a recurring payment or subscription through Braintree? Recurring or subscription payments are not currently supported in the EE4 Braintree payment gateway. When I refund a payment, does it also refund through Braintree? 2) Then login to your Braintree account and process the refund. Is an SSL certificate needed for Braintree? Compliance with the Payment Card Industry Data Security Standards (PCI DSS) is required if you are processing, storing, or transmitting credit card data. Event Espresso helps by using Braintree’s Drop-in Payment UI for payment processing and recommends using a dedicated SSL certificate on your website. View more information on PCI compliance from Braintree.